Josanne Cassar | A perfect family? You are here: Home » Events » A perfect family? What happens when the perfect family is built on a dark secret? 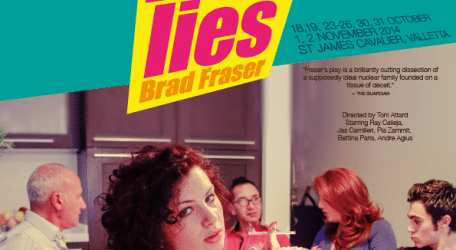 Unifaun Theatre Productions will be tackling this issue when they stage TRUE LOVE LIES by Brad Fraser at St James Cavalier on the 18, 19, 23, 24, 25, 26, 30, 31 October, 1, 2 November 2014. Ticket prices are at €18 (€15 concession) and €12 (€10 concession) on the 23 and 30 October. See Early Bird Discount Scheme below. Kane and Carolyn, along with their children, geeky Royce and outgoing Madison, are the typical nuclear family. But when Madison applies for a job at a new restaurant in town, a man from her parents’ past re-enters their lives, sparking a series of revelations that a humorous, searing and heartbreaking. This sudden reappearance of David exposes suppressed emotions and desires in both parents and children, and all must renegotiate and redefine their relationships as the family is ripped from their comfortable life and forced into a much more uncertain future. Directed by Toni Attard, this production is set to star Ray Calleja, Jes Camilleri, Pia Zammit, Bettina Paris and Andre Agius. Writing is by Brad Fraser, considered a top Canadian talent, whose shows have been successfully produced around the world. Brad Fraser is also a successful screenwriter for both televison and cinema, having penned among others, the popular series QUEER AS FOLK. Unifaun is offering a discount on all tickets bought and collected before 13 September. Please note that discounted tickets MUST be collected before that date. For more details visit the St James Cavalier webpage. Bookings can be made at the above link or on email: [email protected] or telephone number 21223216.